If a child were asked which of the troubles associated with cold he most disliked, he would probably reply, chilblains and toothache. 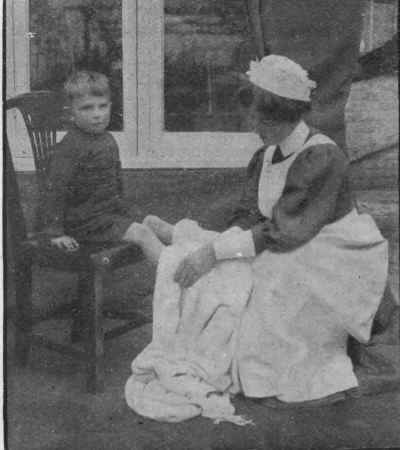 Every boy and girl who has suffered the aches of cold-weather chilblains will regard them as one of the greatest evils that afflict the flesh in childhood. 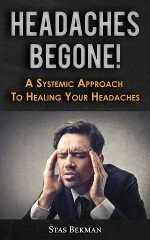 Most of us even now can remember the excruciating agony of toothache when we were twelve, and our childish indignation with the grown-ups in charge of us, who seemed incapable of doing anything to alleviate the pain. Now, in the ideal nursery, neither chilblains nor toothache should ever appear at all. The child who is properly fed cannot contract chilblains, because his circulation is good, his nourishment is up to a certain standard, and his tissues are thus resistant to external cold. The careful mother also, ever vigilant as to the condition of the children's teeth, will regard toothache as a sign that she has somehow proved neglectful and allowed the teeth to get out of order. Let us deal with chilblains first of all. Chilblains, their Cause andwhat is a chilblain ? According to the child, a chilblain is a painful lump which generally appears either on the fingers or toes. The colder the weather, the more painful the chilblains, and the discomfort is often so severe that it will affect the child's health. The swelling is due to a chronic inflammation, which follows upon slowing or congestion of the circulation of the blood in the part. It is a well-known fact that the tendency of cold is to retard the circulation of blood, whilst warmth accelerates it. But the healthier the circulation, the more easily anyone can resist external heat or cold. The hands and feet are more exposed to cold than the more central parts of the body, being farther away from the heart and less protected by surrounding tissue. Thus any sign of defective circulation will appear in these parts, and, in the early stages, extreme coldness of the hands and feet is generally very much marked. Now, mothers should try to understand how the body resists cold, and then they will know how to prevent chilblains and keep the child in such a condition that the circulation is not affected through the cold weather. Heat is generated in the body as a result of what is called the oxidation of food. Food is a fuel, and this is chemically burned up, producing a certain amount of heat in the process. If you light a bonfire, chemical changes take place. Carbon and oxygen are produced - that is, you have oxidation. In the same way the tissues in the body use the food by a process of slow combustion, producing carbon and oxygen, which we expire from the lungs as carbonic acid gas. Fats are the chief heat-producing foods, and young, growing children, who much more easily lose heat than adults, require a large amount of fat. There is a danger in nurseries where diet is not studied intelligently that the children do not have sufficient fat. Children who say that they dislike fat are especially apt to be starved of the necessary fat foods with their meals. A very thin child often shows distaste for fat, and this is not remarkable, because the thinness is due to the fact that he is not getting enough fat in the food. That is why doctors often order thin children a course of cod-liver oil. Insufficient nourishment is perhaps the chief cause of chilblains in the nursery, and certainly one of the best ways to prevent chilblains is to give the children the right amount of fat every day in the diet. Those who live in very cold climates in the northern regions, realising that fat produces heat, take a large quantity of oily and fatty foods to keep them warm. It is a far better way to keep up body heat than to wear heavy clothing and overcoats. Now, mothers must remember that the giving of fat does not necessarily entail a child eating fat meat whether he wishes or not. A little fat meat should be given, of course, finely chopped up with the lean, so that there is no risk of the child feeling a distaste for fat in this form. Better still, fat can be given in the nursery in the form of butter, dripping, or cream ; and for very young children the yolk of an egg, which contains a considerable amount of oils and fats, is quite an ideal food. Olive oil should be used in the nursery far more than it is. Most children will sip it from a spoon at the end of a meal. 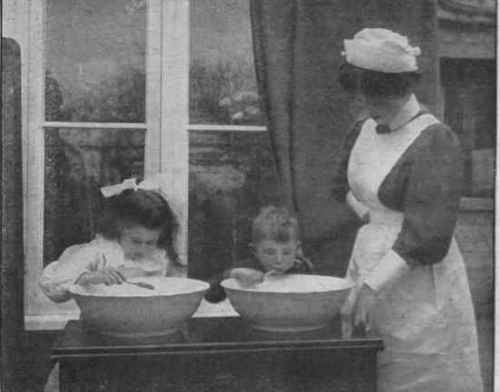 So let the child with chilblains be given porridge and cream for breakfast, plenty of butter at every meal, cream with his pudding, and bread-and-dripping in preference to bread-and-jam. Such foods will prevent any need of cod-liver oil, and in a week or two the chilblains should disappear from the nursery. Although diet is more important than clothing, attention should be paid to this matter also. See that the child is warmly clad next the skin in a light woollen combination garment with long sleeves. Remember that exercise is a stimulant to the circulation, and that no child can be healthy who does not have a certain amount of what may seem to you rough exercise in the form of games, running, and jumping every day. If chilblains appear, whilst realising that you have not used preventive treatment' as you should, you must, of course, be ready with remedies. Everyone knows that the worst thing to do with chilblains is to warm them at the fire. The proper remedy is to stimulate the circulation by rubbing the parts. This should be done two or three times during the day until the foot or hand is in a glow. An excellent plan is to dip the feet or hands in cold water, and then rub them dry with a rough towel. External stimulants are useful. One of the best for the nursery is tincture of iodine. This, of course, must never be applied to a broken chilblain, which should be treated as a wound, with boracic lotion and a dressing of boracic lint. Toothache must also be dealt with by preventive measures. 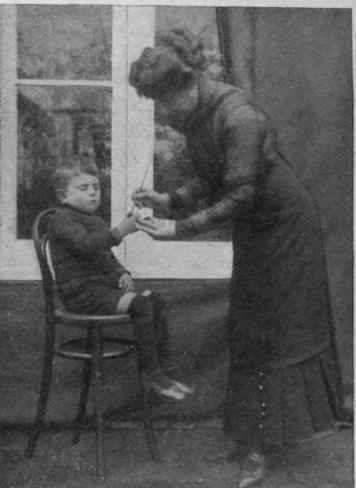 Make it a rule in the nursery that the children's teeth are examined by the mother every month or two, and that they visit the dentist perhaps once in six months. Thus any small hole or wearing of the enamel can be attended to before the tooth is decayed. How can the enamel be prevented from wearing off ? In the first place, children should not be given foods that are either very hot or very cold. Secondly, washing the teeth must be regarted as one of the most important events in the nursery day. Every child should have the teeth thoroughly washed at least twice a day, or, better still, after each meal. The small ones' will require to be 1 by the nurse or mother. Strict cleanliness prevents the deposit of particles . food about the teeth and fermentation taking place. This fermentation produces microbes which eat into the tooth-surface, so that ultimately a hole reaching to the nerve in the interior is made. The pain is an indication that part of the tooth has been destroyed right through to the nerve, so that toothache should never be neglected if it is desired to save the tooth at all. Mothers should be very careful what they apply to the children's teeth in the way of toothache remedies. Many of these substances are strong chemicals, which will injure the sound teeth, although they stop the pain of the decayed one. The wisest plan is to rely upon heat as a toothache remedy in childhood. Keep the child warm, apply hot flannels to the face and ear, and allow him to rinse the mouth out with hot water to which a little tincture of myrrh has been added, a few drops to a wineglassful of hot water. The hot mouth-wash acts as a sort of poultice in the mouth, which relieves the inflammation in the tooth. In the case of a gumboil or abscess due to a neglected tooth, a purgative and light diet comprise an important part of treatment, as in all cases of acute inflammation. Lastly, let a mother remember that the condition of a child's teeth depends also upon her management of the general health. The strong. healthy child has a better chance of growing up with sound teeth than the rickety, delicate, anaemic girl or boy, whose tissues are incapable of resisting microbic infection.